I just finished a new and spectacular version of my Frost Dragon design. Since I did it in black and silver, I can't really call it a "frost" dragon so it's named a "Great Pewter Dragon", and I'm very happy with it! Carved, as ever, from 8oz leather, hand-shaped and painted with colorfast Liquitex acrylics. Sealed for durability, it will come with black organza ribbons for wearing. how much do you charge to do commisions? dude this is amazing. where did you learn how to do this? Wow. I may be late to get on the bus here, but your work is quite impressive. The texture is so tantalizing. And texture that can be conveyed even after photographed is something to truly be considered. Great work. 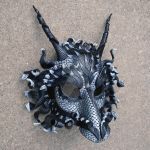 This is the most amazing mask I've ever seen! Wow! Thank you for posting all of your work here to share and your good response rate to remarks. 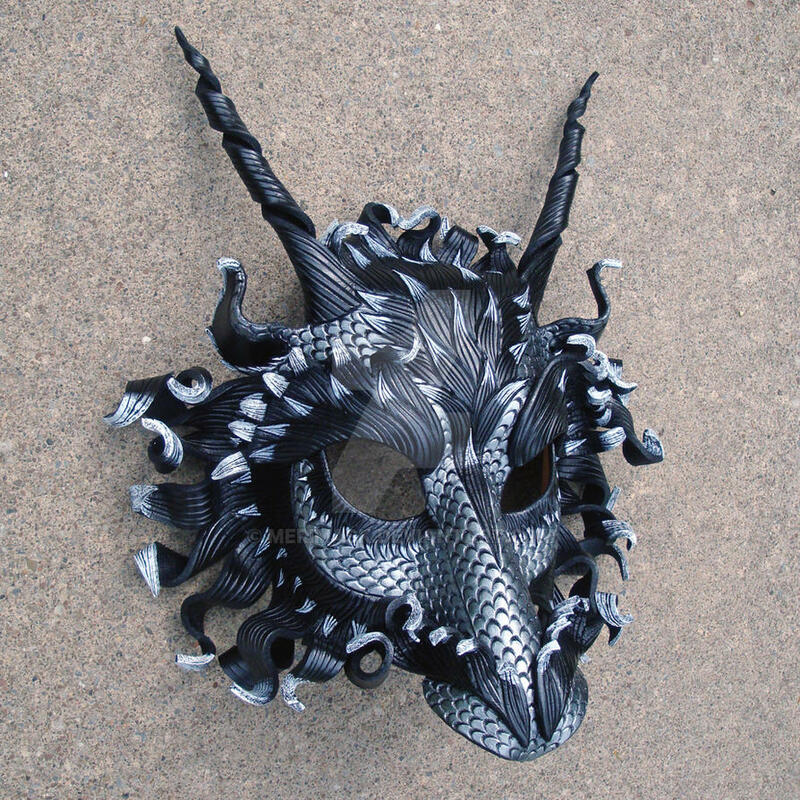 I am just getting into leather mask making and your work is an inspiration. This is one of my favorites that you have posted. I just created and posted my first mask here. You set a gold standard indeed! Well thank you...I'm glad you like it. 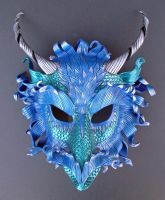 Check the links under my blue cat mask on my front page...I have some tutorials there that might be helpful to you, getting started. Yes. I work on a help desk for insurance agents and since I was scheduled to work this Saturday I have spent all day sitting here, making templates for a couple masks I am going to work on during the next couple days off, and cruising this site. I just read through your tutorials and I found them fascinating. Quite a bit different than some of the other resources I found and some of the techniques I was playing with. It shows you have a high degree of confidence in your work that you are so free about sharing information. I do agree with you that since your craft is based on your own artistic ability to design and create that sharing technique is appropriate. Reading through some of the trials various artists have had with copyright infringement is also interesting. Thanks for sharing! ( By the way your dog is really beautiful). I'm just starting to get interested in leatherwork and I thought I'd check dA for inspiration and ideas of things I could try. I think your stuff just comes under the heading of inspiration though, at least for the time being It'll be a long while before I try something like that! Look on my front page...under the blue cat mask you'll find all sorts of helpful links to tutorials. Awesome, thanks. I'll definitely be checking those out! There is no stitching, is it all just glued? Thanks! Yes, I use a jeweler's flexible epoxy to glue the different parts. It's great stuff...the leather will tear before the bond separates. I used contact cement, and then laced them. They were for a Renn group, stitching was part of the design. I believe the bond was enough, even though I never tried it. Wow, amazing detail! Very lovely and astounding. I've probably used every single positive adjective I could think of commenting on your masks ever since I've started watching you, haha. LOL! Well thank you. Just think; you are becoming a walking talking thesaurus for superlatives. Thanks so much for the feature...I appreciate it. Normally I don't click on masks, but this one is dang impressive. Your detailing work is just so divine!! Is this the actual size of the mask? Nooo. Flattened it's over 18 inches across. Flattened. Thanks so much. Years of practice & experimenting with the medium. It's wonderful! I like the way you did the colours, And the details are like always, Great with a capital G! Thanks! I am really happy with this guy.